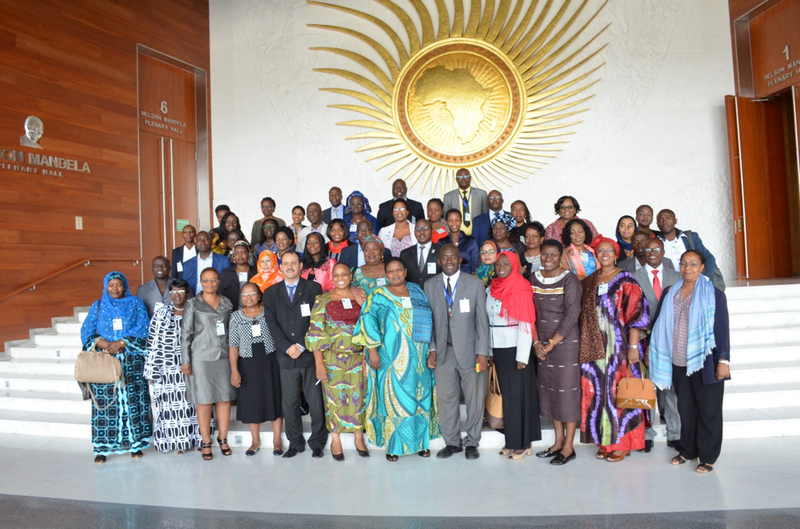 Addis Ababa 7th May 2018: Experts and senior officials from Ministries responsible for Gender and Women affairs from all African Union (AU) Member States convened for the Third Ordinary Session of the African Union Specialized Technical Committee on Gender Equality and Women’s Empowerment (STC-GEWE), which kicked off, today 7th May 2018, at the AU Headquarters in Addis Ababa, Ethiopia. Mr. Joseph Kazima, the Chairperson of the Bureau of the Specialized Technical Committee on Gender Equality and Women’s Empowerment in his opening remarks said, the STC is significant as it will adopt the very important strategies and will also elect the 2nd Bureau. He also recognized the outgoing Bureau comprised of Malawi, Democratic Republic of the Congo (DRC), Togo, Mauritania, and Sudan on the achievements it has accomplished over the past two years and assured the incoming Bureau of its support. In her introductory remarks, Mrs. Mahawa Kaba-Wheeler, Director of Women, Gender and Development Directorate (WGDD) of the African Union Commission (AUC), emphasized on the purpose of the meeting where the STC will adopt the new AU Strategy on Gender Equality and Women’s Empowerment, which will be presented before the AU Policy Organs for endorsement. Mrs. Mahawa highlighted the process for the development of the strategy to be inclusive and participatory and the final document will determine the priorities and programmes for the AU Commission for the next coming years. She also commended the outgoing Bureau under the leadership of H.E. Dr Jean Kalilani for its achievements during its tenure and the incoming Bureau was assured of the support of the Secretariat. The Opening ceremony was attended by AUC officials, experts and senior officials from AU Members States, the Regional Economic Communities, academia, private sector and civil society, and representatives from the development partners and international organizations. Over three days, the Experts Session of the 3rd STC -GEWE will consider and deliberate on a number of issues on their agenda including: the new AU Gender Equality and Women’s Empowerment Strategy, the Evaluation report of the 2009 Gender Strategy, The African Gender Scorecard and Setting up a Committee for the African Gender Scorecard, the Solemn Declaration on Gender Equality in Africa, the progress on the Fund for African Women, and the WGDD policy platforms. The Experts Session will also elect the new members of the STC Bureau, who will hold office for two (2) years. The Experts Session will conclude on Wednesday, 9 May, and will present its conclusions and recommendations to the Ministerial Session, which will open on Thursday, 10th May 2018.